A dugout or dug-out, also known as a pit-house or earth lodge, is a shelter for humans or domesticated animals and livestock based on a hole or depression dug into the ground. Dugouts can be fully recessed into the earth, with a flat roof covered by ground, or dug into a hillside. They can also be semi-recessed, with a constructed wood or sod roof standing out. These structures are one of the most ancient types of human housing known to archaeologists, and the same methods have evolved into modern "earth shelter" technology. 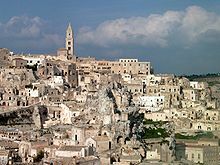 First driven underground by enemies who invaded their country, the Berbers of Matmata found underground homes the best defense against summer heat. In north China, especially on the Loess Plateau, caves called yaodongs dug into hillsides have been the traditional dwellings from early times. The advantage of a yaodong over an ordinary house is that it needs little heating in winter and no cooling in summer. An estimated 40 million people in northern China live in a yaodong. Many people live in semi-recessed dugout houses in north-western China where hot summer and cold winters prevail. 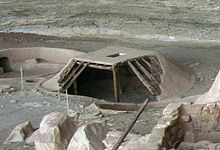 In the Early Jōmon period of Japanese pre-history (10,000 to 300 BC) complex pit houses were the most commonly used method of housing. During the Bar Kokhba Revolt, Jews used an intricate system of man-made hideout complexes, prepared well in advance of the onset of the revolt. Many such sites were discovered in Judaea and the Galilee, for instance at Horvat 'Ethri. 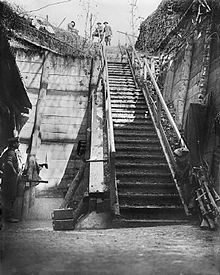 In the Netherlands the dugout (Dutch: plaggenhut) was banned by the housing safety law of 1901. 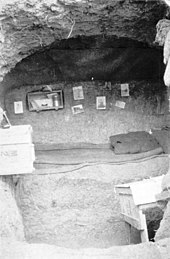 In some areas in the east the country, people lived in dugouts into the 1960s. 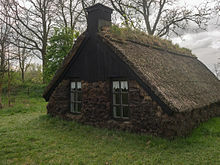 Dutch dugouts are constructed around an excavated pit with a roof made from heather sod, and front and back walls made from slabs of peat. Peat diggers and their families lived in these, in life-shortening conditions of poverty, damp and insect infestation. A small number of these huts survive, and can be seen in the open air museums of Arnhem, Schoonoord, Barger-Compascuum and Harkema. Modernized dugouts are available as tourist accommodation in several locations. In Serbia they are called zemunica. Also, the town of Zemun derived its name from Zemln, which is akin to zemunica. These first homes, often called soddies, were small rooms dug into the side of a low rolling hill. The walls were built up with sod blocks to a height of seven or eight feet. Holes were left for purchased doors and windows hauled from the nearest town or railhead. Cottonwood poles were laid side by side to form a support for a roof made of a thick layer of coarse prairie grass. Over this was carefully fitted a double layer of the sod building blocks. Rain helped the sod to grow and soon the dugout roof was covered with waving grass. Some frontier families found that their cows grazed on their roof, and occasionally had them fall through. The floor of the dugout home was of dirt or rough wooden planks. Walls were lined with newspapers pasted or pinned up with small, sharpened sticks to keep dirt from flaking into the home's interior. Some families used fabric on their walls while others created a plaster coating from local limestone and sand. Some were carpeted and other variations included building on a second room for school teachers or guests. Heating could be provided by burning buffalo chips or cow chips. The home's comfort and structural stability were maximized when the structure was located on the south side of a low hill, with adequate drainage to provide run-off for rain and melting snow. 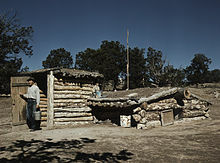 Most pioneer dugouts had a short lifespan, being replaced by plank or rock homes when farmers had time and money to create larger, more traditional homes. 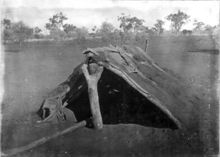 When a family built a house of logs or boards, their domestic animals often continued to be sheltered in a sod dugout.